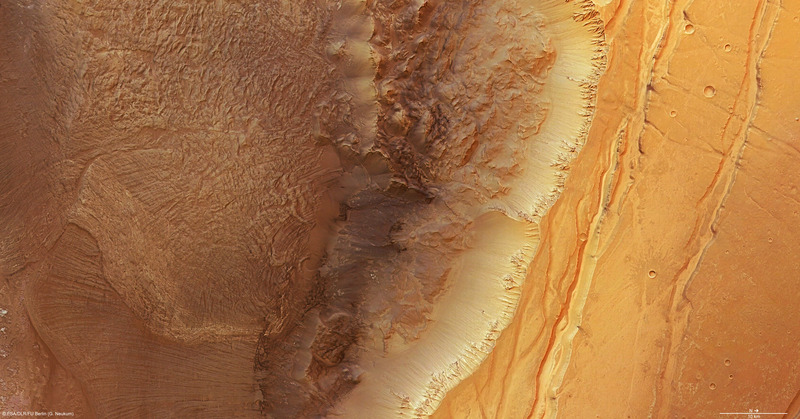 Ius Chasma is one of the main graben in Valles Marineris, one of the largest known canyon systems in the Solar System. Over a length of 940 kilometres, Ius Chasma forms the northern boundary between the western half of this enormous valley system and the Martian highlands. 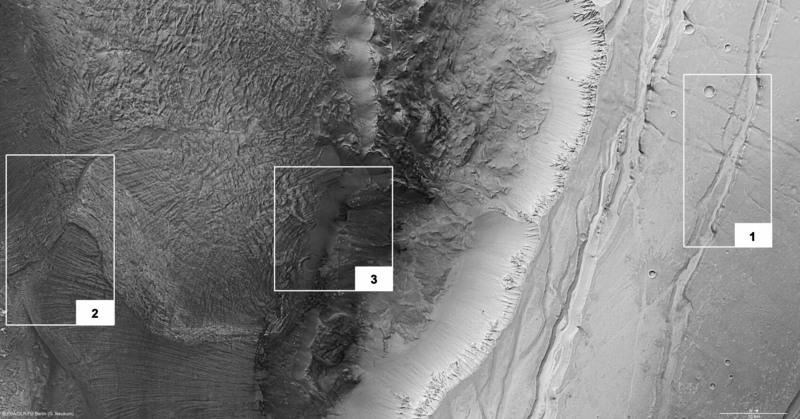 These images, acquired with the High Resolution Stereo Camera (HRSC) operated by the German Aerospace Center (Deutsches Zentrum für Luft- und Raumfahrt; DLR) on board ESA's Mars Express spacecraft, show a section of the northern scarp of Ius Chasma, along which landslides have occurred. As with the East African Rift on Earth, the Martian crust split and formed this gigantic canyon system, 3500 kilometres long and up to 11 kilometres deep. 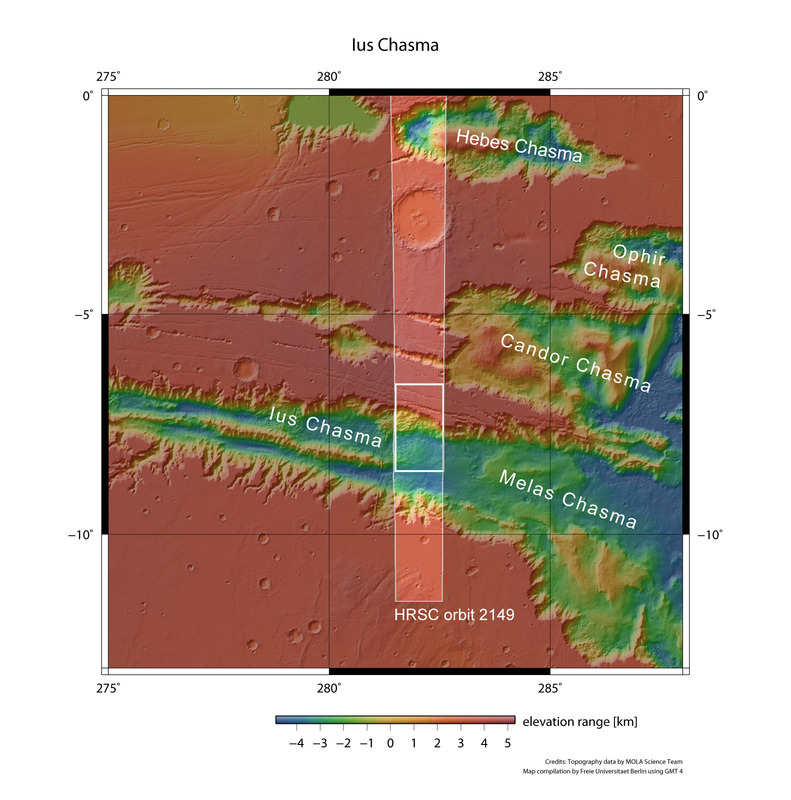 The trigger for this crustal tectonic activity was the formation of the Tharsis Bulge, the largest volcanic region on Mars, consisting of multiple lava flow deposits with a total thickness of several kilometres. The load that this imposed gave rise to immense stresses in the planet's crust, leading to the formation of faults. 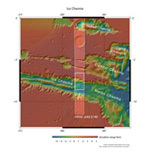 The Tharsis Bulge started forming over three and a half billion years ago during the Noachian Era, the earliest period in Mars' history, and continued until late in the Hesperian Era, which ended around three billion years ago. Both of these geological periods saw a significant increase in volcanism on Mars. 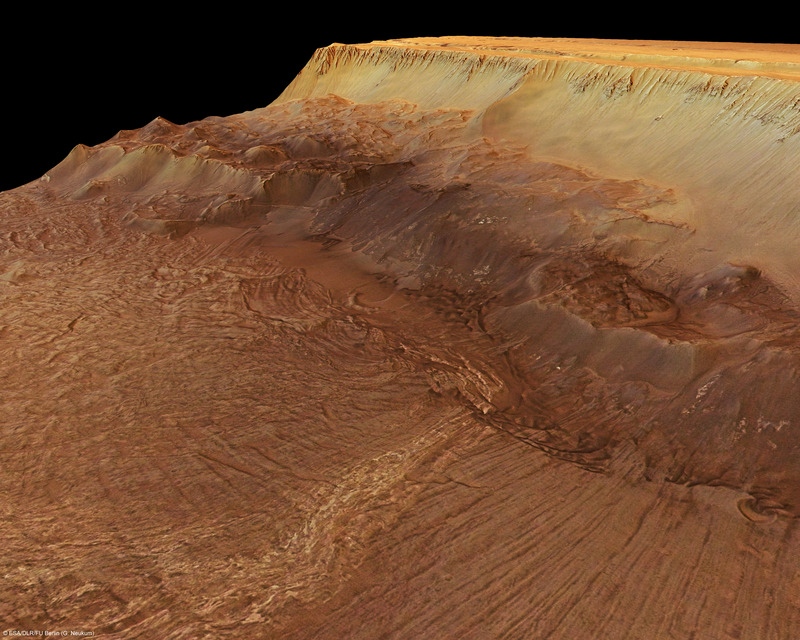 The images show part of the graben that is bordered to the north by one of the Martian highland plateaus. 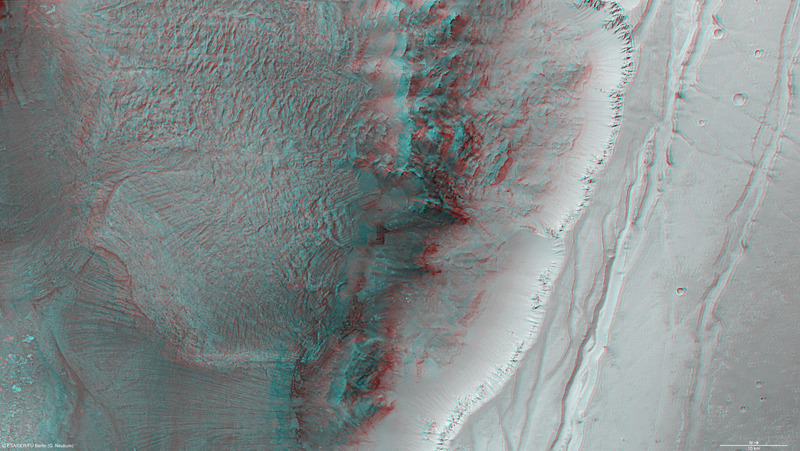 The scarp drops 8.2 kilometres to the floor of the chasma. The immense stresses in the rock created multiple parallel faults, leading to the formation of the grabens; traces of these faults can also be seen on the plateau, where the stresses have created smaller, parallel grabens in some places. Additional faults have occurred at right angles to the main system (image detail 1). 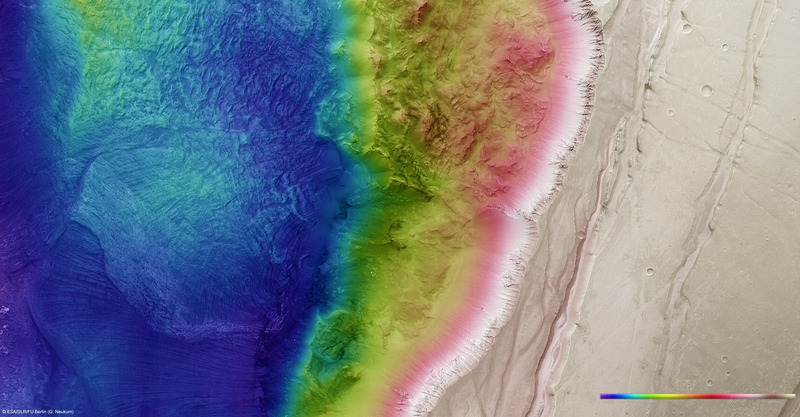 Multiple large, overlapping landslides have collapsed into the chasma (image detail 2). A light, streaked zone can be seen along the uppermost, and hence most recent, landslide. This could indicate a change in the material making up the highlands in this region. Remnants of an older landslide can be seen in image detail 3. Large, dark structures catch the eye in the centre of the area shown. These dunes accumulated here as a result of the Martian winds. Their dark colour is probably due to their being composed of dust and sand from weathered basalt, which is one of the most common iron- and magnesium-rich volcanic rocks on Earth as well. 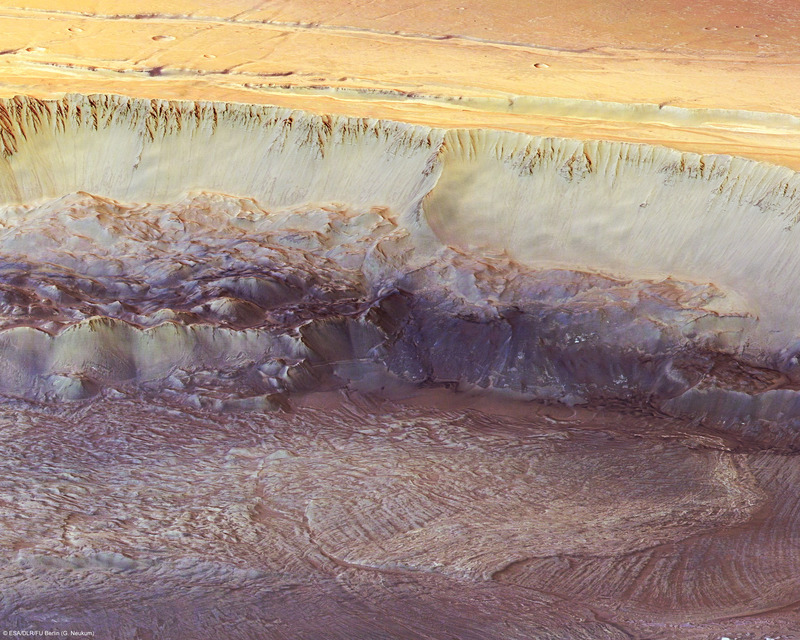 Several light-coloured deposits nearby may be landslide material that has been exposed to weathering for a shorter time; this is bedrock from the nearby Martian highlands that has been exposed along the scarp and underneath, in the open. The landslide deposits also exhibit flow structures that can be seen as elongated meandering rilles, fanning out with increasing distance. It is possible that ice or water stored in the highlands played a part in causing the landslides. The term 'chasma' (Greek for crevice, abyss or fissure, plural 'chasmata') is used by the International Astronomical Union to refer to a steep-sided, elongated depression or valley. 'Ius' refers to Io, one of Zeus' favourites in Greek mythology, after whom Jupiter's moon Io - also volcanically active - and the Ionian Sea are named. The HRSC images were acquired on 16 September 2005 during orbit 2149 from an altitude of a little over 250 kilometres. The best image resolution is about 13 metres per pixel. The images show an area at 7 degrees south and 282 degrees east. The HRSC camera experiment on the European Space Agency's Mars Express mission is headed by Principal Investigator (PI) Professor Gerhard Neukum (Freie Universität Berlin), who was also responsible for the technical design of the camera. The science team consists of 40 co-investigators from 33 institutions in ten nations. The camera was developed at DLR under the leadership of the PI and it was built in cooperation with industrial partners EADS Astrium, Lewicki Microelectronic GmbH and Jena-Optronik GmbH. The instrument is operated by the DLR Institute of Planetary Research in Berlin-Adlershof, through ESA/ESOC. The systematic processing of the HRSC image data is carried out at DLR. The images shown here were created by PI-group at the Institute of Geological Sciences of the Freie Universität Berlin.